How Many Calories Does a Sausage Biscuit Have? 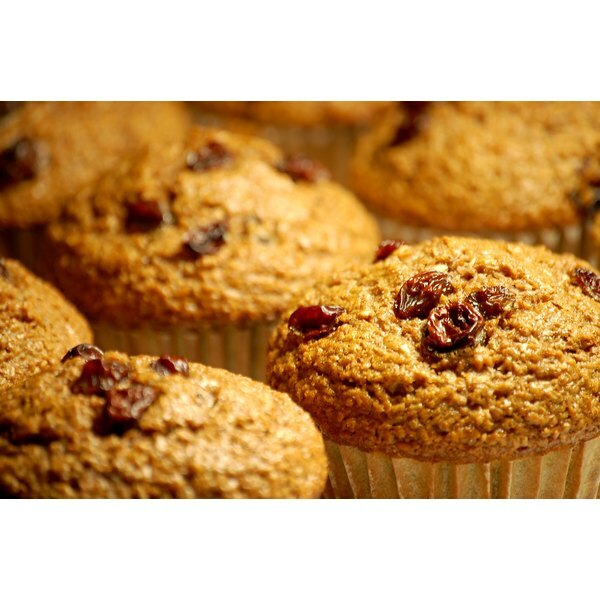 Raisin bran muffins offer the sweetness of raisins and nuttiness of bran for a breakfast treat or quick snack. The calories in a raisin bran muffin can help you get the nutrients you need, as well as the energy you require. A 4.5 oz. raisin bran muffin contains 360 calories, according to CalorieKing.com. When following a 2,000 calorie diet, this serving of muffin accounts for 18 percent of the calories you should consume daily. Many of the calories in a raisin bran muffin come from carbohydrates, a nutrient whose primary function in your body is to provide energy, notes MedlinePlus. And CalorieKing reports that a 4.5 oz. raisin bran muffin contains 65 g carbohydrates, or half the carbohydrates the Institute of Medicine suggests you eat every day. A raisin bran muffin also contains 6 g protein. A 4.5 oz. muffin containing raisins and bran has 10 g of fat. CalorieKing reports that amounts to 15 percent of the fat you need daily. And the U.S. Department of Agriculture recommends you limit fat consumption to no more than 35 percent of your caloric intake.